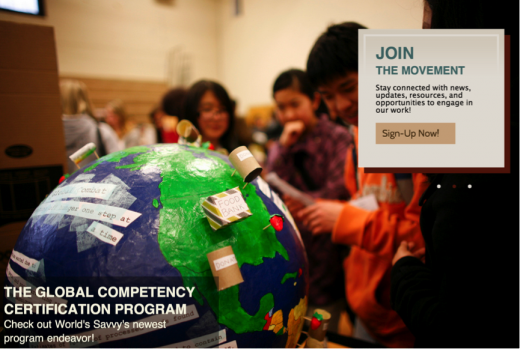 World Savvy helps students to develop qualities and skills that enable them to thrive and be good global citizens. Young people learn how to develop their critical thinking, collaboration and teamwork. They also learn how to do in-depth research, use media and make powerful presentations. Here are excerpts from the organisation’s website. You can discover more via the following link. World Savvy prepares the next generation of leaders to learn, work and thrive as responsible global citizens in the 21st century. We support systemic change in K-12 education to provide every student in every classroom with the content knowledge, skills, values and attitudes to be leaders and changemakers in their diverse communities, locally and globally. World Savvy was founded in San Francisco by Dana Mortenson and Madiha Murshed in response to a critical need for youth to acquire global knowledge and 21st century skills within the conspicuous absence of global education programs in K-12 education in the United States. Since that time, we have grown from serving 90 students and 20 teachers in our first year, to reaching more than 250,000 youth and 2000 teachers over our eleven year history from three offices nationally: San Francisco, Minneapolis-St.Paul and New York. Here are students working on a project with people in Bangladesh. This growing need for true global competency in our increasingly diverse and interconnected local & global communities has helped to propel World Savvy into a national leader in global education. Our dynamic programs and services help youth in middle and high school learn how to think rather than what to think about critical global and community issues, which are often complex and unaddressed in school, and have enormous implications for their local community.